Investigate the life of a disturbed New Yorker who brought terror to the streets and unleashed all his hatred on the one group whom he considered had rejected him the most - women. 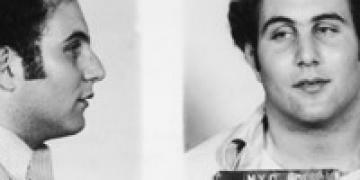 David Berkowitz, who became infamously known as the ‘Son of Sam’, first struck on the morning of 29 July 1976. It was the beginning of many brutal attacks that were to terrorise New York City’s citizens over a one-year period. During the summer of 1977 at the height of the killer’s notoriety and with the city in a collective panic over who was going to be his next victim, bars and nightclubs were deserted. It seemed that the efforts of the NYPD and special task teams couldn’t bring the serial killer, who indiscriminately shot his victims with a 44-calibre handgun, to justice. Today, Berkowitz, former Son of Sam and now devout Christian, languishes behind bars and is unlikely ever to be released. Berkowitz was brought up by middle class adoptive parents. However, his birth mother Betty Broder, grew up in Brooklyn, a poor single Jewish mother trying to cope with bringing up a young daughter. She later had a relationship with Joseph Kleinman and became pregnant by him. Kleinman wasn’t happy about the idea of another child and so when David was born on 1 June 1953, Betty put him up for adoption. David was taken in by Nathan and Pearl Berkowitz who were devoted to him. There was nothing in his childhood to indicate that he would become a violent serial killer. However, as classic serial killer profiles go, he was a loner and isolated from his peers. Like many children and teenagers he felt unattractive and, although neighbours remember him as being a ‘nice-looking’ boy, he tended to display an aggressive, violent streak and often bullied other children. His parents found it difficult to cope with his hyperactive behaviour. One event that is said to have disturbed him, and perhaps made him bitter about life, was losing his adopted mother to cancer when he was still a teenager. Pearl Berkowitz succumbed to the illness in 1967 at the time when the family were meant to relocate into a new residential home. Instead of moving into the Co-Op development together as a family, just David and his father ended up sharing the apartment. It was after Pearl’s death that Berkowitz became more mentally unstable. He developed a sense of self-persecution, as if the world was conspiring against him. By the time his father remarried and moved away to Florida, eighteen-year-old Berkowitz had become increasingly isolated and cut off from society. At the same time as his sense of alienation grew, so did his capacity for fantasy and self-delusion. In the summer of 1971 he joined the army where he excelled as a proficient marksman. It was this kind of disturbing skill that was to be his tool for killing in such a cold callous manner a few years later on the streets of Queens and Brooklyn. Originally Berkowitz had been religious, but his faith was shaken after the death of his mother and later he delved into Judaism and the Baptist faith. Eventually he lost interest in religion altogether. Also, despite Berkowitz later claiming that his anger and resentment had been fuelled by his mother’s rejection of him, he did actually contact her during the early 70s and developed a relationship with her and his half sister, Roslyn. The family, far from being hostile, were open and welcoming. However, for some unknown reason David eventually lost interest in them and stopped visiting. He was still a virgin when he joined the army and his only sexual experience during his three-year service was with a prostitute. The incident gave him a venereal disease and gradually his anger and frustration with women became acute. It was then that he developed a taste for arson, setting hundreds of fires in the city. This destructive path of setting fire to buildings was soon to metamorphose to something more sinister – the killing and maiming of innocent people. There is an indication of how his psychotic mind was heading when he wrote a letter to his father that illustrates an acute sense of paranoia and neurosis: "The people, they are developing a hatred for me. You wouldn't believe how much some people hate me. Many of them want to kill me. I don't even know these people, but still they hate me. Most of them are young. I walk down the street and they spit and kick at me. The girls call me ugly and they bother me the most. The guys just laugh. Anyhow, things will soon change for the better."